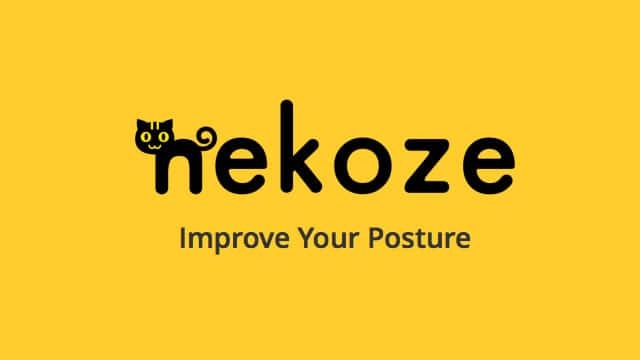 Nekoze is a free app that will monitor your posture while you’re sitting at your computer and alert you when you’re stooping. It uses the built-in iSight camera to monitor you, or an external webcam if you’re using a Mac Mini. The word Nekoze actually means ‘slight stoop’ in Japanese, and I know when I’m sitting down to write at my MacBook I’m frequently getting a little ‘nekoze’. I think using a laptop causes stooping because the screen is usually lower than your eyes. So unless you can raise your laptop or plug into a second monitor it will be difficult to maintain perfect posture. 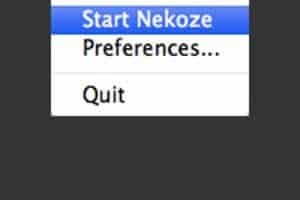 I spend a lot of time at my MacBook, so let’s see if Nekoze is going to nag me like my mother and subsequently get ignored and uninstalled. Or if it’s actually going to prove useful. I don’t like being told what to do, especially by a computer, so I already have my doubts before I install it. When Nekoze is installed there will be a small icon with a cat’s face in your toolbar. 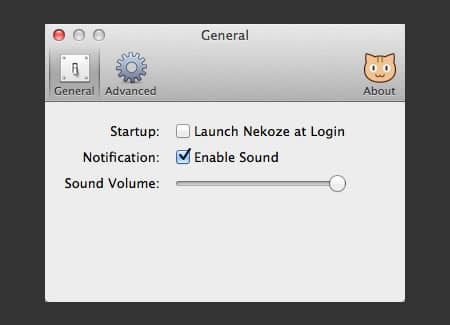 To make Nekoze start monitoring your posture click on the icon, and from the drop down menu click ’Start’. You will get a pop-up message telling you to sit up straight and click start to begin monitoring. When you click the start button your camera will turn on and you will be under the gaze of a silly looking cat. I started writing. And then I stopped. And I got nagged. First by a cat’s meow, and then a pop-up notification with that weird cat’s eyes looking at me. It didn’t take long either. I straightened my posture and continued to write. But in the corner of my eye I could see the camera, and in the back of mind, I was waiting for the alert. I found it a distraction, but I tried to forget about it. And just when I was getting into the flow it went off again. Stupid cat! So I decided to have a look in the preferences. To access the preferences click on the icon and choose ’Preferences’ from the drop-down menu. There aren’t too many options you can change. 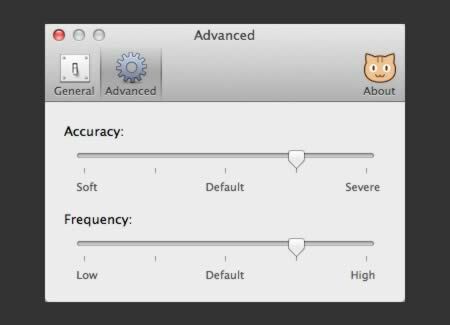 From the General tab, you can turn the sound down or disable the sound altogether. It was the first thing I did. Under the Advanced tab, you’re able to change the Accuracy and Frequency of the alerts. I decided to keep the accuracy at the default level and turn the frequency down to low. With the frequency on low and the sound disabled I was able to get on with my writing. I’m not sure if I’ll keep Nekoze installed. Mainly because I hate being distracted while I work. But if you’re more tolerant to nagging than me, and you feel like you need to correct your posture, Nekoze could be a good solution for you. Download Nekoze in the App Store.